This book was written by the granddaughter of Eleni Gatzoyiannis, the subject of the superb book of the same name, and which was made into a movie. Eleni Gage, her granddaughter and an American, has penned an eloquent and moving account of her life and her odyssey to the village in Greece where her grandmother was murdered. Back to rebuild the home her family lived in at the time of the Greek Civil War (1946-49). We're treated to delightful snippets of family lore so rigidly clung to in many immigrant families. Despite her successful life in New York, Ms. Gage felt drawn to her roots and to rebuild her grandmother's razed home, despite the "warnings" of her aunts back in Massachusetts. Ms. Gage paints an amazing picture of the village of Lia in northern Greece, and we get to know the characters making up the villagers, their beliefs and superstitions, their habits, the celebrations, and day to day living. Just when I'd formed my own pictures in my mind, I came across some expressive black and white photographs, not only of the new house, but also the people! What a treat. Greek customs are explained and this wonderful little village truly comes to life. You feel the young Eleni has done well by her grandmother. 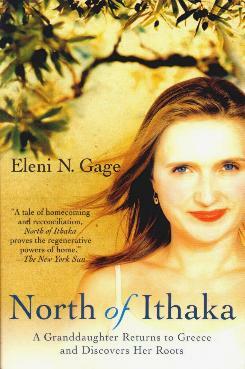 Eleni's father, Nicholas Gage, wrote the book Eleni. This should also be made into a movie. Conclusion - Charming and beautifully written.